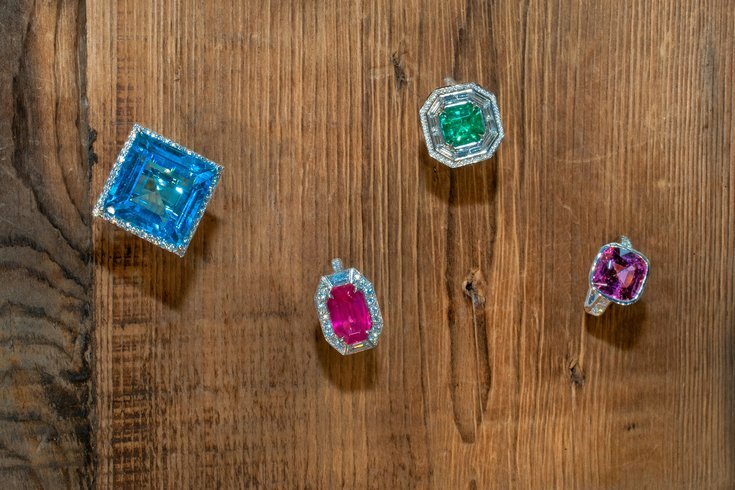 Clockwise, from top left: 46.54ct square emerald cut blue topaz ring with 100 round 1.32ct diamonds ($3,375); 3.59ct platinum emerald cut emerald ring with round and baguette diamonds ($51,300); 8.87ct platinum cushion pink spinel ring with 10 round diamonds ($53,200); 7.92ct platinum emerald cut red spinel ring with 2 trapezoid diamonds and 94 round diamonds ($91,000). Warmer weather has finally joined us in Philadelphia, and spring means bare legs, sunglasses and some sparkly bling. That's where Craiger Drake Designs, a Philly-based private wholesale jeweler, comes in. Whether you're in the market for some serious ice or you just want to spend some time ogling their designs, take a peek below. If you spend the rest of your day dreaming of diamonds, well, we don't blame you. 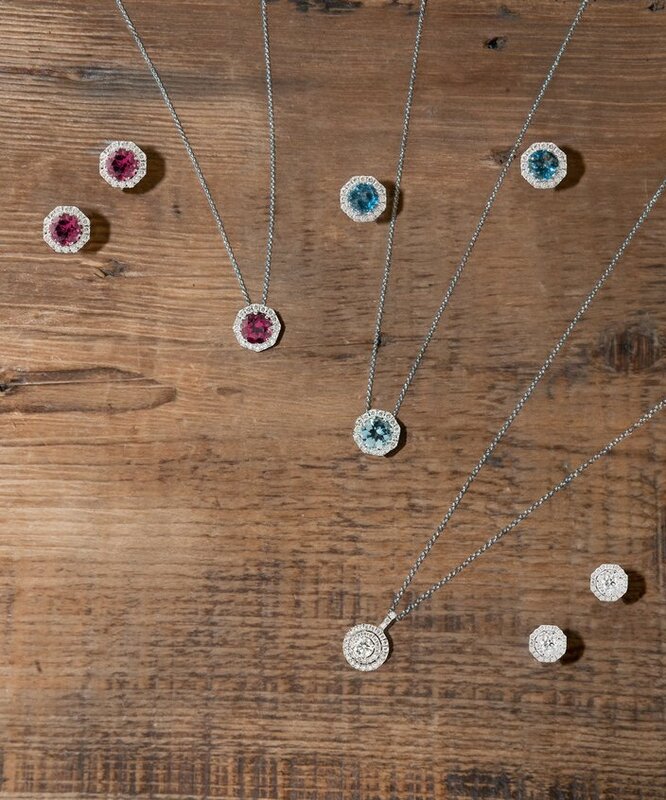 Clockwise from top left: 18kt white gold earrings with 2 round pink 2.57ct tourmalines and 32 round diamonds ($1,550); 18kt white gold pendant with 1 round 1.29ct pink tourmaline and 16 round diamonds, with chain ($960); 18kt white gold earrings with two 2.24ct aquamarines and 32 round diamonds ($1,300); 18kt white gold pendant with 1 round 1.02 ct aquamarine and 16 round diamonds, with chain ($950); 18kt white gold pendant with 1 round .31ct diamond and 37 round diamonds ($1,880); 18kt white gold cluster earrings with 14 round 1.11ct diamonds ($1,150). 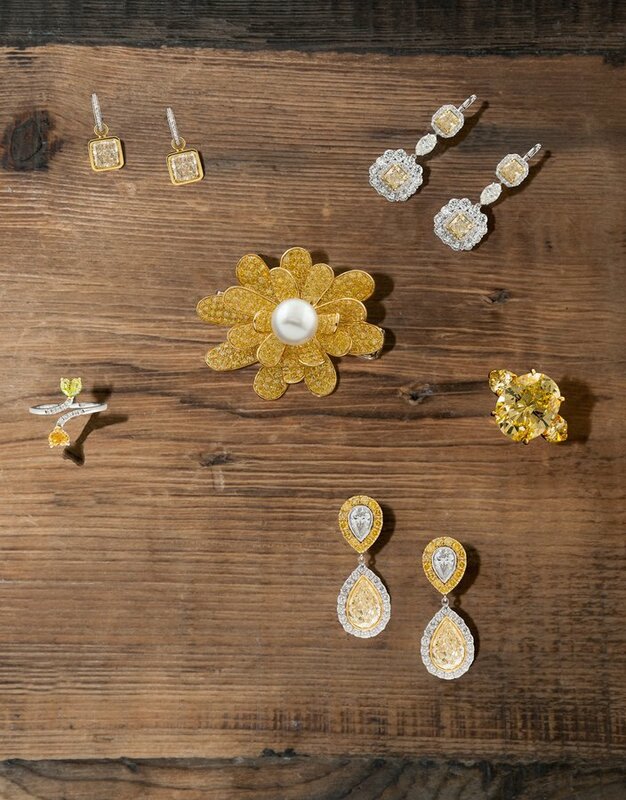 Clockwise from top left: 18kt white gold estate earrings with 2 radiant yellow 3.48cts diamonds and 24 round diamonds ($12,500); Platinum dangle earrings with four 4.11ct radiant cut fancy light yellow diamonds, 2 marquise diamonds and round diamonds ($35,000); 18kt yellow gold ring with 1 oval 10.53ct Fancy Intense Yellow diamond and 2 pearshape yellow diamonds ($384,750); Platinum and 18kt yellow gold dangle earrings with 2 Fancy Yellow 3.01ct pearshape diamonds, 2 pearshape 1.47cts diamonds, 26 Fancy Intense Yellow diamonds and 36 round diamonds ($124,740); 18kt yellow and white gold ring with one .50ct fancy intense orange yellow heartshape diamond, one .45ct fancy vivid yellow green heartshape diamond and 10 round diamonds ($6,300);Center: 18kt yellow gold estate pin with 1 south sea pearl and round yellow diamonds ($11,000). 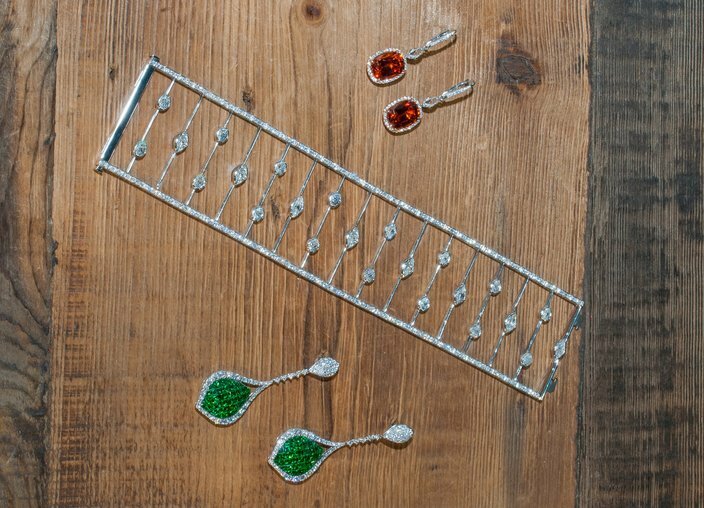 From top: 18kt rose and white gold dangle earrings with 2 cushion 11.62ct spessartite garnets, 2 marquise rose cut .45ct diamonds and round diamonds ($21,000); Platinum bracelet with 8 marquise 3.11ct diamonds, 16 oval diamonds, 17 round 2ct diamonds and 20 round .22ct diamonds ($34,650); 18kt white gold dangle earrings with 2.25ct round diamonds and invisible set princess cut 10.10ct tsavorites ($7,580). 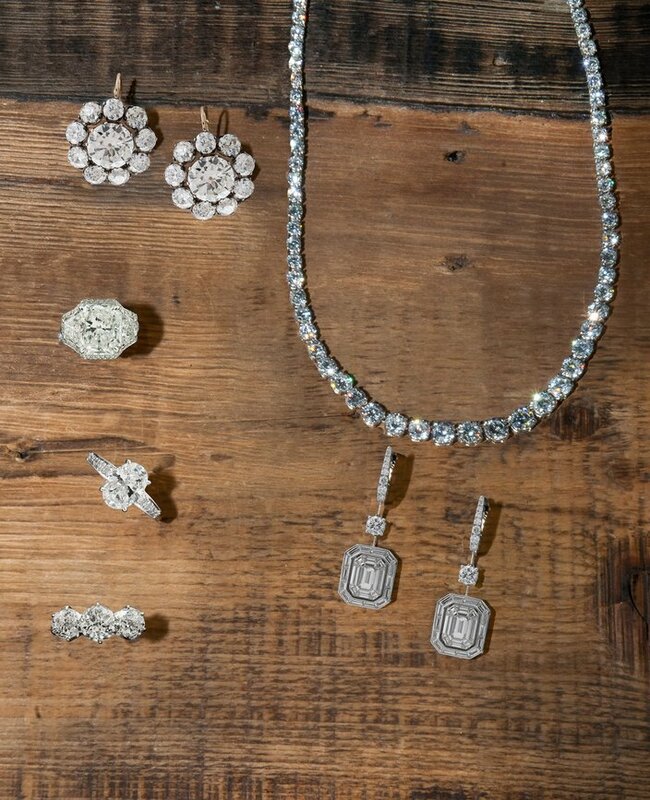 Clockwise from top right: Platinum diamond Riviera necklace containing 85 round 20.10ct diamonds ($49,140); 18kt white gold dangle earrings with 5.83ct baguette diamonds, 2 round .84 ct diamonds and 11 round .25ct diamonds ($22,400); Estate engagement ring, 18kt yellow gold with 1 jubilee round 1.71ct diamond and 2 round diamonds ($21,000); Platinum engagement ring with 8 round .25ct diamonds with engraving on the side shank mounted with a 2.52ct oval diamond ($33,750); Platinum ring with 1 radiant 6.13ct diamond, 2 trapezoid diamonds and 6 round diamonds ($250,000);18kt yellow gold and sterling silver dangle earrings with 2 round diamonds (4.41ct and 4.43ct) and 18 round 9.85ct diamonds ($154,000). 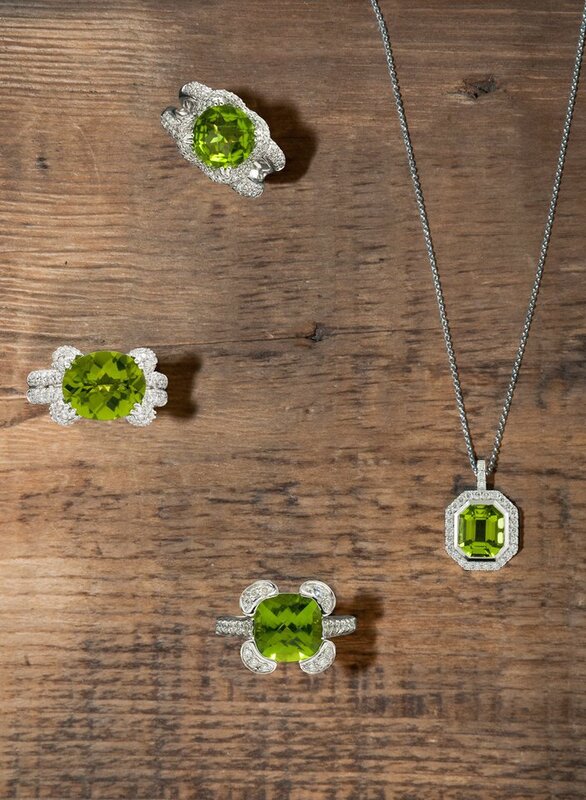 Clockwise from right: 18kt white gold pendant with 1 emerald cut 2.33ct peridot and 29 round diamonds, with chain ($900); 18kt white gold ring with 1 cushion 4.74ct peridot and round diamonds ($1,500); 18kt white gold ring with 1 oval 4.78cts peridot and round diamonds ($2,020); 18kt white gold ring with 1 oval 4.78cts peridot and round diamonds ($2,020).